We have a lot of travel plans this summer, but when we’re not on the road there’s only one place we will be — the swimming pool! We joined a new gym that has an amazing family-friendly outdoor pool area. We’ve been taking advantage of it as often as we can which means I’ve had to up my game when it comes to getting prepared. 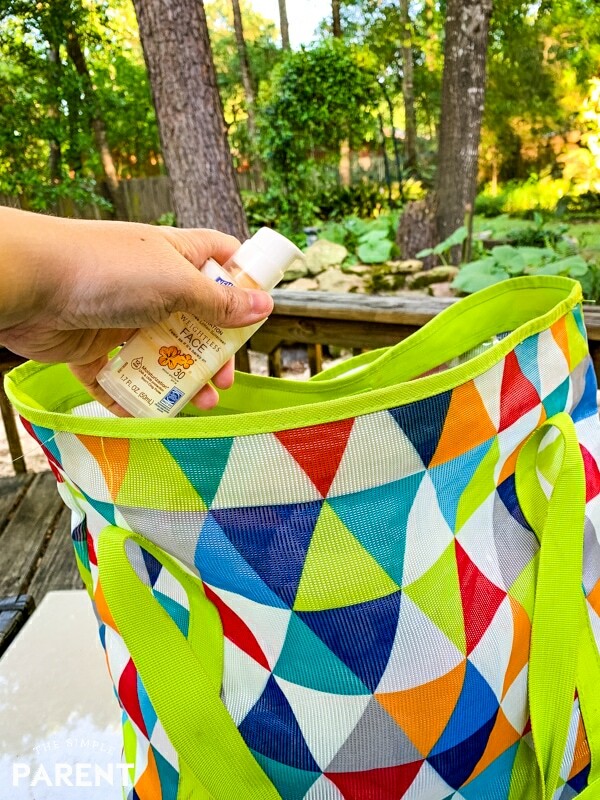 You can get ready for afternoons spent by the pool with these Summer Pool Bag Essentials! We’ve got all the basics covered here! When it comes to packing the best pool bag for your family, I’ve found that a lot of it has to do with focusing on what your kids actually need when you’re at the pool. There are so many things you COULD take with you, but then you end up lugging around a bunch of extra things you don’t really need. Yes, I’ve been guilty of doing that before! So figuring out what your family actually uses at the pool is step one. Don’t worry, we’ve got some suggestions to help keep it simple. Step two is sorting through all of the pool bags and totes that are available to find one that fits your needs! That can sometimes feel overwhelming, but I’ve got some tips to make it easier too! There are four main areas that I’ve figured out that I need to cross off our list for a successful day at the pool. Although things like swimsuits and towels are important, there is one basic that I’ve learned is a make or break it for us when we go to the pool. For my family, it’s all about the pool snacks. 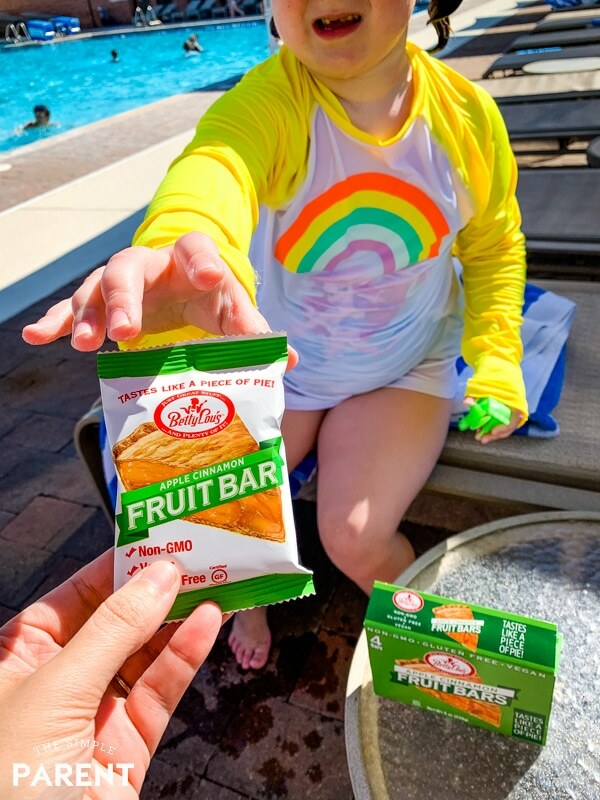 Pool snacks for the kids and pool snacks for adults! Spending a day in the sun and water leaves us all hungry! Swimming has always made me hungry. I can remember being ravenous after swim team practice when I was a kid. My kids are the same way. 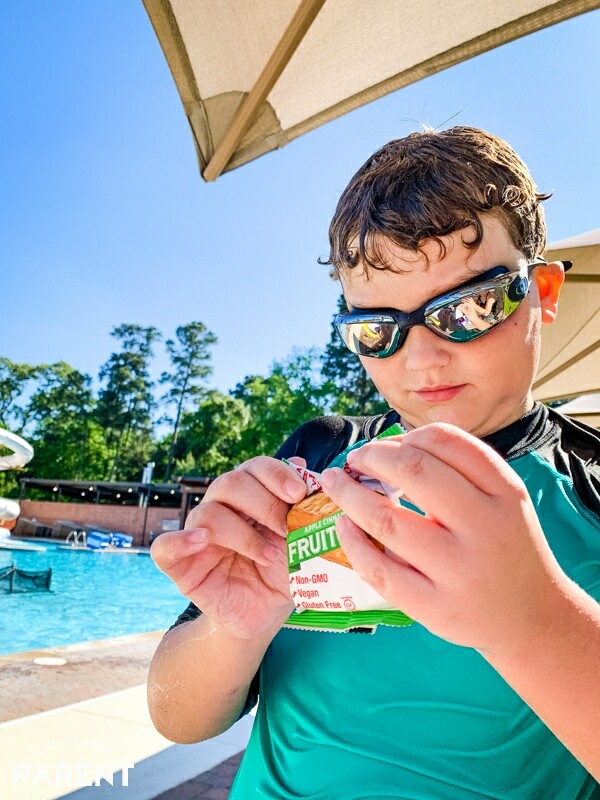 Whether they’ve just finished their swim lessons or they’re just hanging out at the pool with their friends, having snacks on hand makes the day go more smoothly. Our gym has a cafe where we can buy snacks and even get meals, but I’ll admit that I don’t want to spend on that every time we’re at the pool. Plus, I like to have snacks that are a little better than the bag of chips my kids always choose! If we’re hanging out all day long, we usually get lunch there but I bring plenty of water and our own snacks for other times so we have some options I feel really good about. I always pack things like individual bags of crackers, fruit snacks, and apples. But I recently discovered a brand new snack that we’re all enjoying! 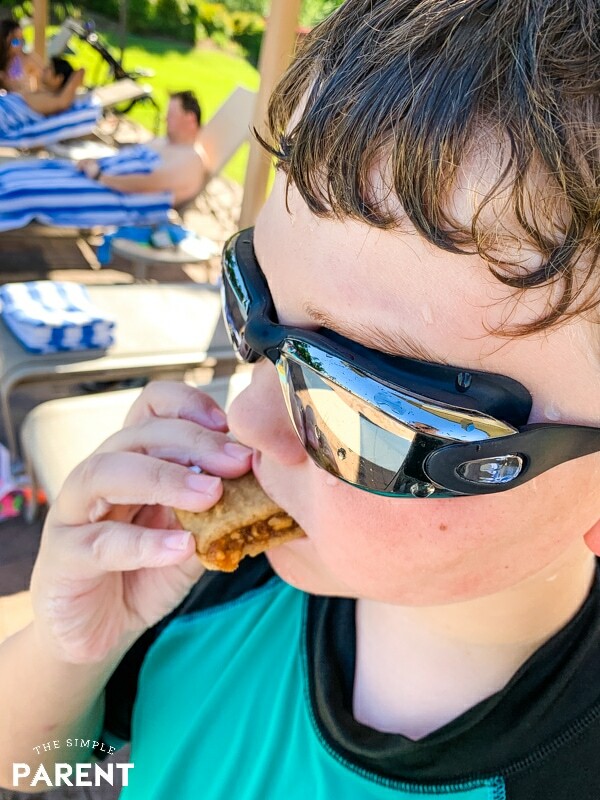 I have a huge sweet tooth (that I’ve passed along to my daughter) and when we’re by the pool, it seems to flare up. So I’m always looking for snack ideas that will help me soothe the sweet tooth while being better for me. Betty Lou’s Fruit Bars have me covered in this area and my kids have been loving them! That is a snack win for me as a mom! Betty Lou’s Fruit Bars come in four different flavors including Apple Cinnamon, Blueberry, Blackberry, and Cherry. All of the sugars in them come from natural fruit and fruit juice. I love that, but what I love even more is very simple. Yes, they’re so delicious. My biggest challenges are choosing which one to enjoy and making sure I get one before the kids snag them all! Carrigan is in love with the Apple Cinnamon flavor and I’m a huge fan of the Cherry. 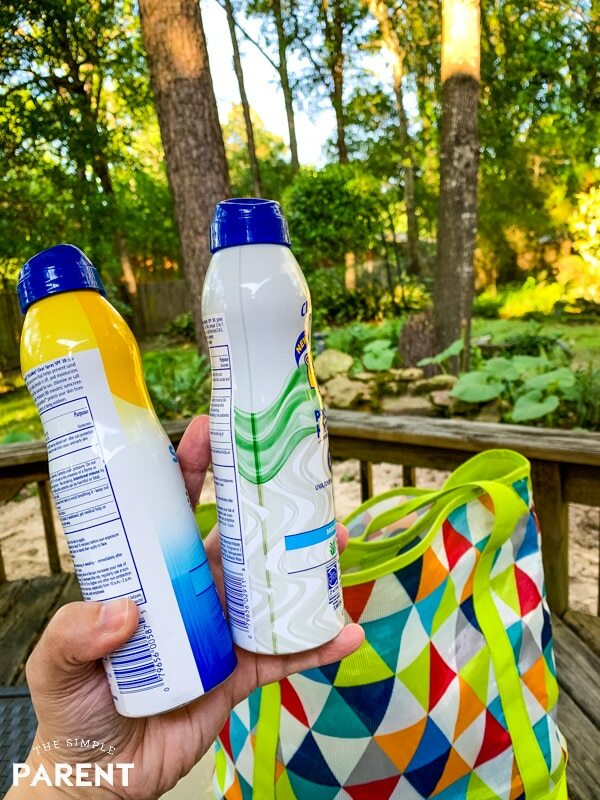 So the two of us might hide a few of each to make sure we have our favorites at the pool! Don’t tell Grambo or the boys! We spend a lot of time at the pool with friends during the summer. 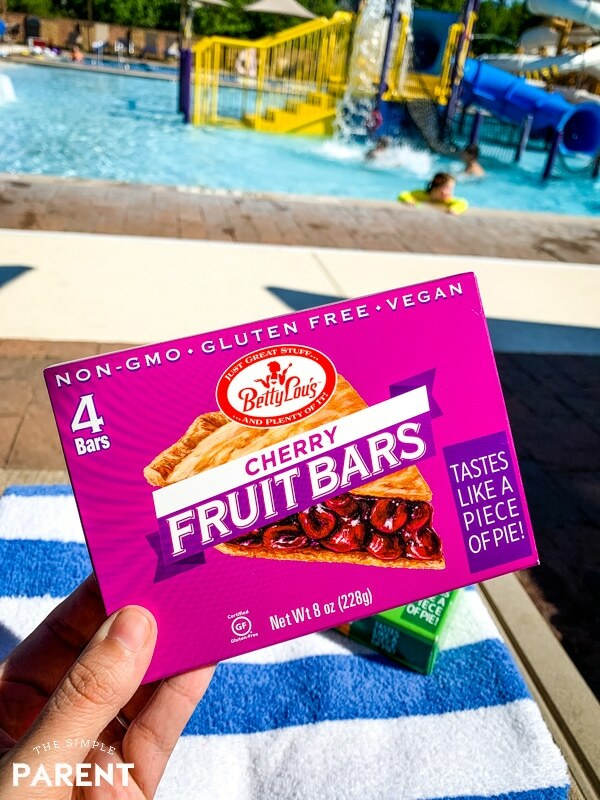 Betty Lou’s Fruit Bars are Gluten-Free and do not contain any of the 8 major food allergens identified by the FDA. This means I can feel safe sharing with all of the kids at the pool! That’s huge when you just want the kids to all laugh and enjoy themselves during their summer break! 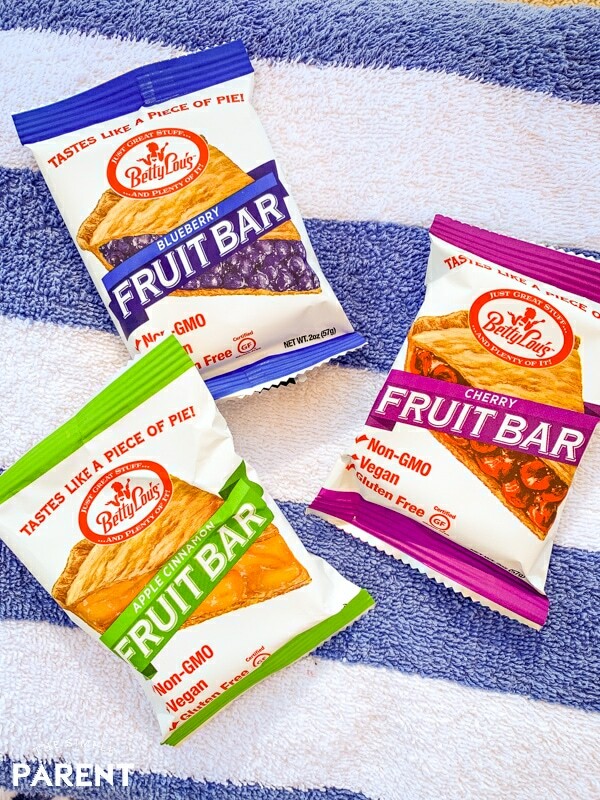 Betty Lou’s Fruit Bars are available at Walmart and Betty Lou’s Inc! I pick up ours when I’m doing our weekly grocery shopping at Walmart which makes it super convenient to stock up! I’m ready to conquer pool snacks all summer long! If you’re using a public pool or a pool at your local health club, be sure to check if they allow pool toys for kids. 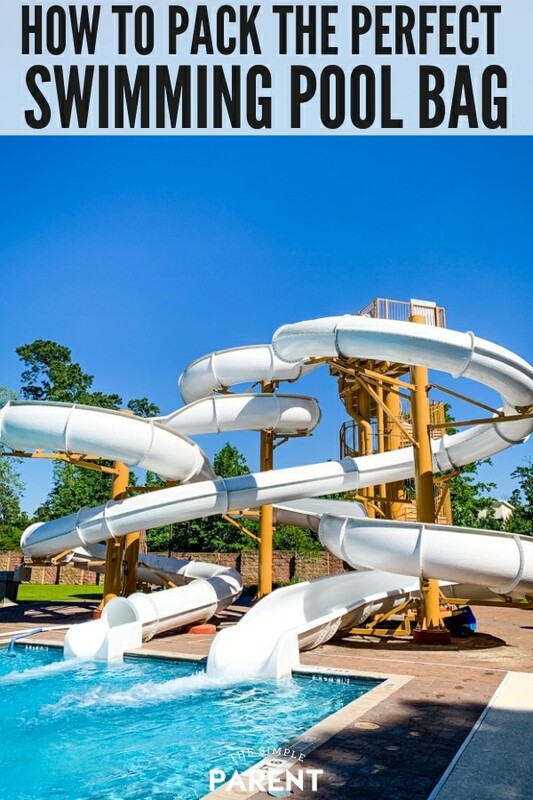 My kids loved them so we’re happy we can use them at our local pools. 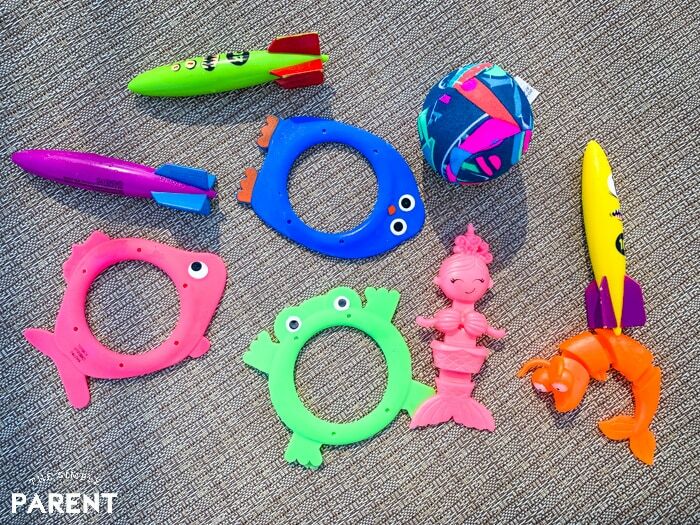 I’ve got a few recommendations for pool toys to make them easy to manage in your pool bag. My first recommendation is to skip anything inflatable. They’re a pain to inflate and deflate each time you hit the pool. My kids always seem to lose interest in them quickly. Plus, some of them are really big and can be sort of a nuisance in the pool if there are a good number of people swimming. Then I focus on keeping it small. 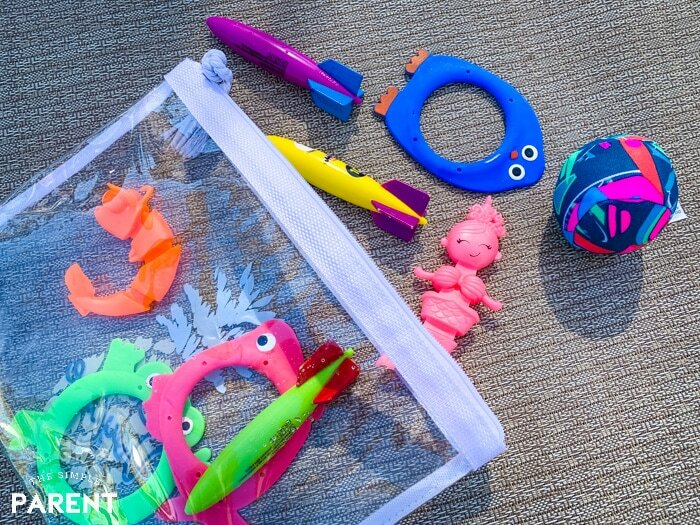 Smaller toys are easier to pack in the pool bag! Smaller dive toys that sink are great for older kids and younger kids who have good swimming skills. If you look around, you can also find a lot of toys that look like dive toys but actually skim the top of the water or float. These are great for all kids, but especially younger kids who want to play too! We have a few balls that are made for the water, but we only use them when it isn’t too crowded at the pool. They’re small enough to toss in the pool bag easily too. But my dear son has a baseball throwing arm and doesn’t always turn it off when he’s at the pool. So we don’t always get out the balls! If you stick to the smaller toys, then I highly recommend getting a makeup bag that is made of plastic and zips up to store the toys in. It’s perfect for tossing in the tote. When I get home from the pool, I do unzip it and let the bag sit out so the toys can dry off before putting it away for our next trip to the pool! When it comes to pool towels, I like to get the big beach towels. But I have one word of advice if you’re using a new pool this summer. Find out if you even need to bring your own towels! 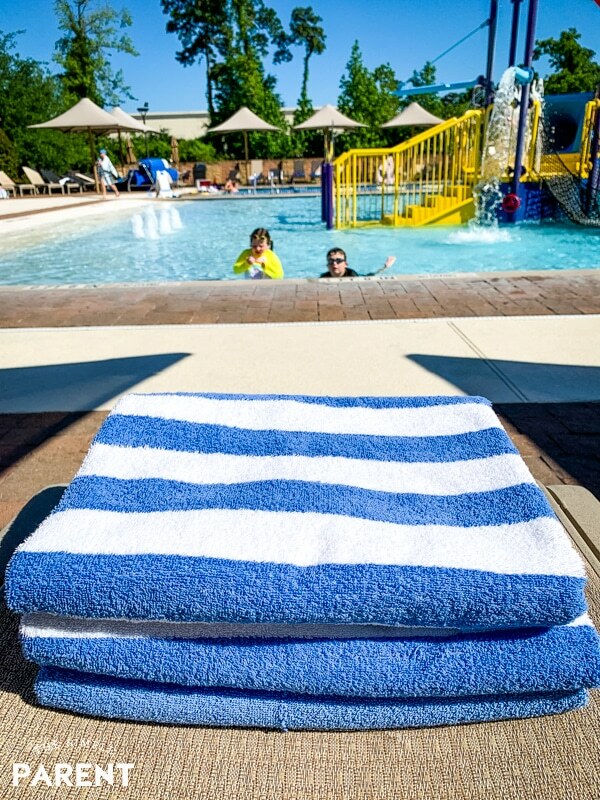 Our new gym provides all of the pool towels! It’s been a huge space saver for me! One less thing to try and pack in our pool bag! If you do need to bring your own towels, I always opt for a few larger beach towels and usually bring one or two smaller, standard sized bath towels. My biggest advice when it comes to towels is to pack them in their own pool tote! It might feel like a lot more to lug two bags with you, but I’ve found that the convenience factors is so worth the second bag! 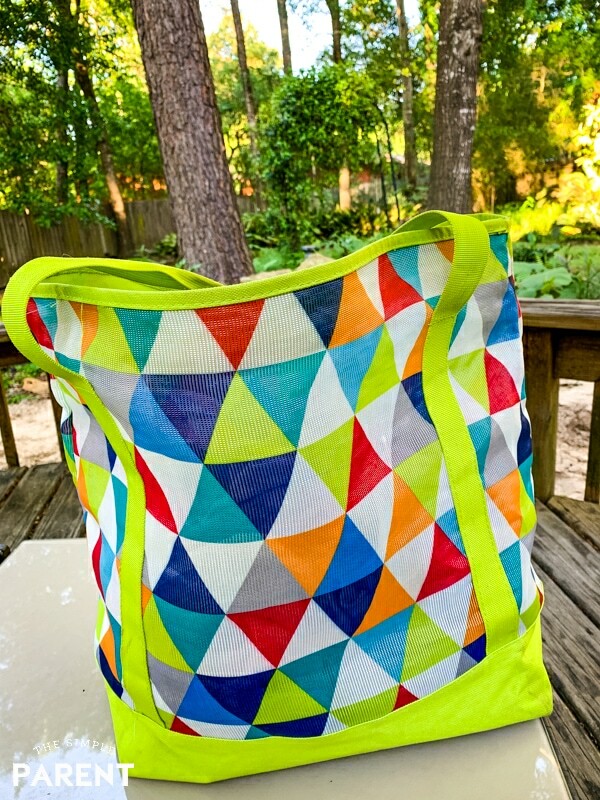 Have one pool bag dedicated for towels and everything else can go in the other one. My other priority is protecting the entire family from the sun. Sunscreen (and plenty of it) is essential if you’re spending an extending period of time at the pool. Our pool has plenty of cabana type umbrellas to offer some shade, but the pool is in the full sun and I want us all to be protected. The best sunscreen for kids that I’ve found is spray sunscreen. It’s so convenient to use that I’m much better at making sure it gets used. I have some special sunscreen cream especially for faces, but otherwise, I’m always stocked with a few cans of spray sunscreen. Our pool does a five-minute safety break each hour which is a great reminder to reapply our sunscreen. If your pool doesn’t do an hourly break, I recommend setting a recurring alarm on your phone! It’s what I had to do last summer to make sure I didn’t lose track of time! I’ve also become a huge fan of sun protective clothing. It makes life by the pool just a little bit easier and I feel like everyone is better protected. I recommend checking out some of the following items. Your family can wear most of them to the pool so they don’t take up room in your bag! My kids have blue eyes that are very sensitive to the sun so I always make sure I have extra sunglasses on hand. 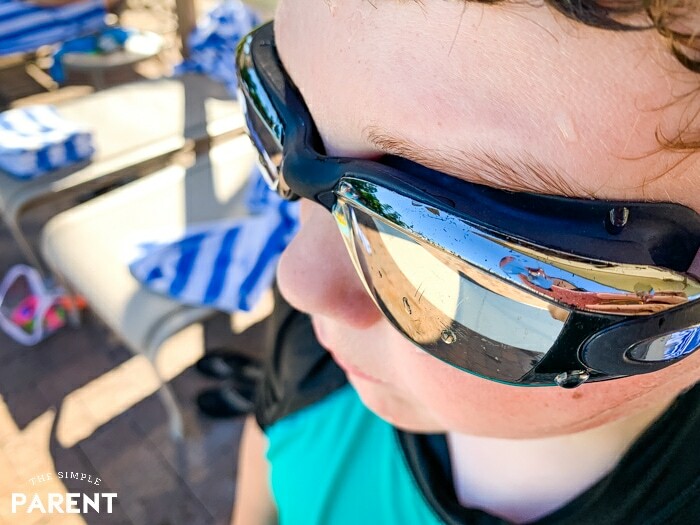 When we buy new goggles each summer, I also look for tinted ones with SPF to help protect their eyes! I also stash a small basic first aid kit in our bag for general safety with bumps and bruises! No matter how large or small you like your pool bag, there is one thing I’ve figured out. Pool bags with pockets are where it’s at and they’re what makes the swim life easier during the summer. When you’re looking for a new pool bag, it’s easy to get caught up in how cute some of them are! But I always look for something that is going to handle being around water well and something that has a ton of pockets. I like it to have a few interior pockets and at least one zipper pocket somewhere on the bag. Outside of those three things, I’ve had bags of all shapes, sizes, and designs. So if you’re planning to spend a lot of time at the pool this summer, keep it simple! 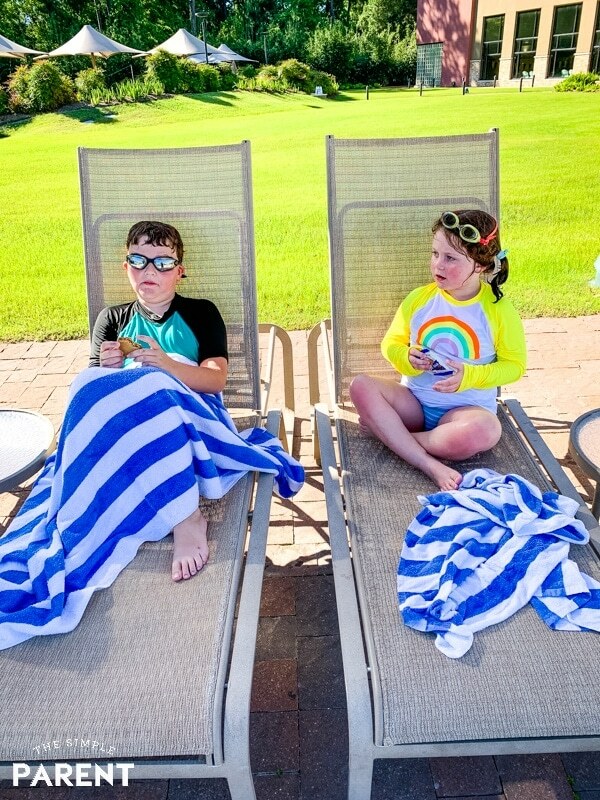 Grab a notepad and make a list of your summer pool essentials that your family needs. Then go through the list a second time and see if they’re all really essential. Once you have it down to the basics that you need to have a great time (and a safe time), you’ll find it so much easier to pack up the pool bag and head out to enjoy a day in the sun! « Healthier Crock Pot Chicken Parmesan You Have To Try!